When cleaning a wooden gym floor, most people focus on visible dirt and dust. Obviously, this has to be cleaned. What a lot of maintenance people overlook is the presence of sweat on the floor. 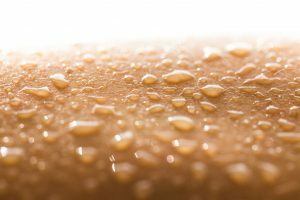 Athletes sweat profusely, and while that sweat is clearly obvious when it is wet, there is little to see once it has dried. Sweat includes proteins and salts, substances that are not removed by wet mopping, even when using solvent based cleaners. In order to get the floor really clean and remove that dull film that can cause long term damage, it is necessary to use a cleaning solution that specifically addresses the removal of the components of sweat.